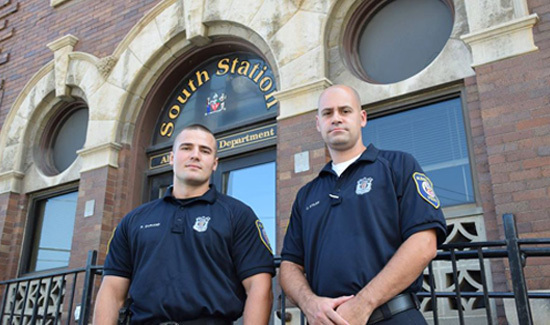 Albany, NY police officers Christopher Stiles and Philip Durand were in the right place at the right time and managed to save the day. According to CBS News, two Albany, New York police officers are being credited with rescuing a pregnant woman and her friend from floodwaters late last summer. Officer Christopher Stiles was responding to a call around 6 p.m. when he saw water rising fast in a residential area. He immediately called for back up. Officer Philip Durand responded and the pair shut down the intersection. As they were making sure traffic was diverted from the flooded area they saw a vehicle pull out of a parking lot. It stopped and immediately began taking on water. The two women inside escaped the rising water by standing on the trunk as the car became submerged. Officers Stiles and Durand made their way through the chest-high water to rescue the women. Neither of the women knew how to swim and thankfully Officers Durand and Stiles were able to carry them to higher ground in a nearby yard. Neither woman, both in their 20s, were hurt during the rescue. Officials said one of the women is six-months pregnant.